Justitia est habitus animi, communi utilitate conservata, suum cuique tribuens dignitatem. Eius initium est ab natura profectum; deinde quaedam in consuetudinem ex utilitatis ratione venerunt: postea res et ab natura profectas et ab consuetudine probatas legum metus et religio sanxit. Justice is a habit of the mind which attributes to each person his dignity and his <ius>, preserving a due regard to the general welfare. Its first principles proceed from nature. Subsequently some practices became established by universal custom, from a consideration of their utility; afterwards the fear of the laws and religion sanctioned proceedings which originated in nature, and had been approved of by custom. 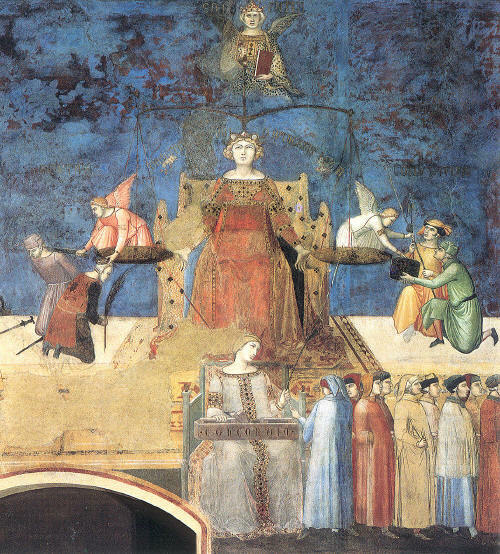 Ambrogio Lorenzetti, Justice, Palazzo Pubblico, Siena, ca. 1340 A.D.